Tuberculosis (or TB) is a disease that humans have lived with and died from for thousands of years. It has been present throughout recorded history, and there is evidence of tuberculosis infections in ancient Egyptian mummies, in ancient India and China, in classic Greek texts, and in Native American peoples centuries before contact with Europeans. It persisted throughout the middle ages, and in medieval Europe it was believed that scrofula (inflammation of the lymph nodes of the neck caused by TB) could be cured by “The Royal Touch,” simply being touched by the monarch of England or France. Cartoons such as this were often printed in TB publications both as humorous distractions and as illustrations of the serious nature of the disease. From San Beams Vol. 3 No. 1, April-May 1955, p. 7. Image courtesy of Newfoundland and Labrador Collection, Provincial Resource Library, A.C. Hunter Library, St. John's, NL. Tuberculosis was widespread in Europe throughout the 18th and 19th centuries, and at various times the cause was attributed to witches, fairies, poor diet, and poor air quality. Medical doctors began to better understand TB in the 19th century, however, linking TB of the lungs, scrofula, and skin lesions to the same disease. In 1882 Robert Koch isolated and identified the TB bacillus. Koch established that the disease was spread by exposure to the TB germ. This changed the medical community's understanding of how to prevent and treat the disease, and eventually made it possible to develop vaccines and effective anti-TB drugs. Koch received a Nobel Prize in 1905. Usually caused by the bacteria Mycobacterium tuberculosis (although sometimes caused by Mycobacterium bovis), TB is often a latent infection with no symptoms and no adverse effects on the sufferer's health. However, about one case in ten progresses to active TB, typically affecting the lungs (pulmonary TB) causing chest pain and severe coughing. The sufferer coughs up sputum and often blood. Fevers, night sweats, chills, and weight loss are also symptoms. Although TB usually attacks the lungs, it can also attack the bones and joints (especially the spine), the lymphatic system, the membranes of the brain and nervous system, and other body parts. Pulmonary TB causes lesions and cavities in the lungs, and the damage to body tissues from all types of TB is fatal in about 50 percent of cases if left untreated. TB is contagious (although, contrary to popular belief, not highly so), and is mainly spread through the air. When a person infected with active TB coughs, sneezes, or spits, they release the TB bacillus which can then be picked up by others. TB bacteria are tough, and can survive for weeks in a dry state (in dried spit, for example), and a person in close contact with someone who has active TB is likely to become infected themselves, especially if they are exposed to the disease for long periods of time. There was little that could be done for TB sufferers before sanatoria came into widespread use, and most cases were treated at home with a wide variety of treatments and procedures that had equally varied results, including carbolic acid, gold, arsenic, menthol oil and other substances taken orally or inhaled. Cod liver oil was found to have positive results for TB sufferers, although the role of vitamin D (of which cod liver oil is a rich source) in boosting immunity to TB was not understood until the 1980s. By the late 1800s belief in the restorative powers of fresh air was common. Once germ theory became accepted and TB was understood to be contagious, sanatoria became the primary method of treatment for active TB cases. Sanatoria were intended to be places where TB patients were quarantined to prevent the spread of the disease, and places where they could rest, get fresh air and have good food. This “rest cure” was the main philosophy behind sanatoria treatments in the 1910s and 20s. 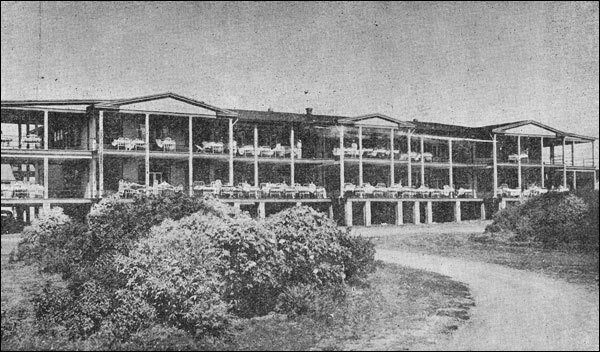 Note the beds on the balconies, where the patients were exposed to fresh air. From San Beams, Vol. 3, 1945, p. 2. Photo courtesy of Newfoundland and Labrador Collection, Provincial Resource Library, A.C. Hunter Library, St. John's, NL. By the 1930s TB patients still spent long spells in sanatoria, but treatments were becoming more intensive and invasive. While patients were still expected to rest, surgical treatments became common. Surgical treatments were usually based around the theory that a TB-infected lung needed to “rest” in order to heal. The procedures included pneumothorax and plombage (inserting air, oil, wax, or Lucite balls into the chest cavity to collapse all or part of an infected lung to allow it to heal), thoracoplasty (removing ribs to collapse a lung), and phrenic crush (crushing or severing the phrenic nerve, which would paralyze half of the diaphragm and reduce the functioning of the corresponding lung). Later, lobectomy and pneumoectomy (removal of part or all of an infected lung) became more common. 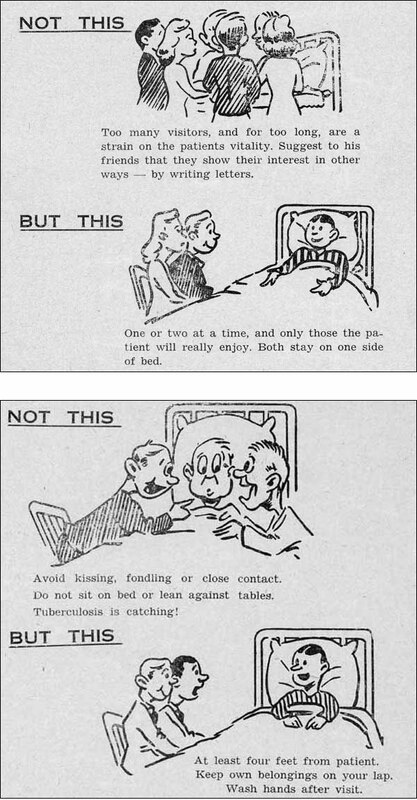 Cartoon from San Echoes illustrating the proper way to visit a sanatorium patient without causing them stress or catching TB. San Echoes was published by the Corner Brook Sanatorium patients. From San Echoes Vol. 2 No. 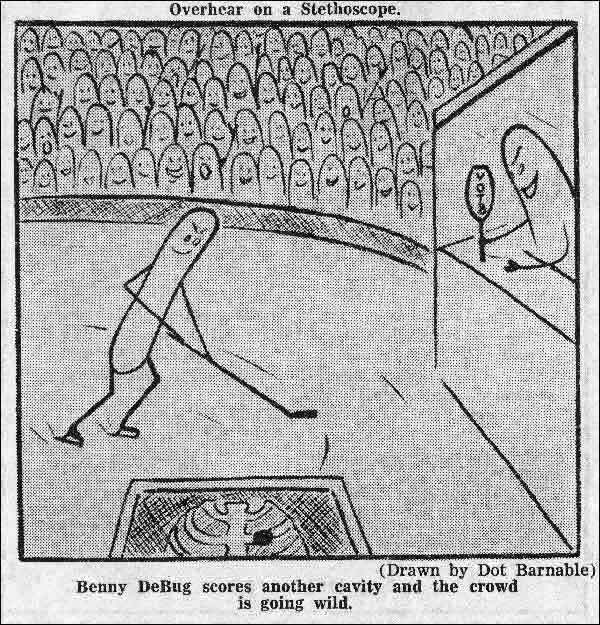 5, January 1954, p. 3. Photo courtesy of Newfoundland and Labrador Collection, Provincial Resource Library, A.C. Hunter Library, St. John's, NL. Approximately 35 percent of TB patients in Canada received surgical treatment in the 1940s. But by the early 1960s this had dropped to 5 percent, mainly due to the effectiveness of new drug treatments. Introduced in the 1940s, chemotherapy and antibiotics quickly become the main treatments for most infections. Anti-TB drugs that came into use included streptomycin, isoniazid, and para-aminosalicylic acid (PAS). Most TB cases were treated with drugs by the 1960s, and drug therapy remains the standard treatment today. In addition to new drugs for treatment, a new method of prevention became available. The BCG vaccine (bacille Calmette-Guérin, named for the two researchers who created it) was developed in the 1920s and 1930s, and was widely used in the 1940s and 1950s. The vaccine is approximately 80 percent effective in preventing TB infections, although its effectiveness varies according to factors such as age and location of the patient. A major BCG vaccination campaign in Europe after World War II prevented a feared TB epidemic, and it was widely used around the world, in the United Kingdom especially. The use of drugs virtually defeated TB in western developed countries by the 1970s, and sanatoria were closed. Although TB is still regularly diagnosed (especially among those with compromised immune systems) it is now easily treatable with drugs, although the course of treatment can take up to a year. There were 1700 new cases of TB in Canada in 2007, for example, but only 200 deaths. Among developing nations, however, TB is still a major problem. One-third of the world's population is thought to be infected with TB, mostly in Asia and Africa, and a new infection happens every second. Although most of these are latent cases, 1.3 million people died of TB in 2008. Of particular concern is the discovery of TB strains that are resistant to anti-TB drugs. While TB is no longer the dreaded disease that it once was in the western world, it is far from beaten. The first possible case of tuberculosis in Newfoundland was recorded by John Guy at his colony in Cupids in 1611, although it is difficult to be certain that the disease was in fact TB. Records are rare until the late 1800s, but given the prevalence of the disease in Europe, it is reasonable to assume that TB had a constant presence among the European-born and descended population of Newfoundland and Labrador. That Europeans brought the disease with them is demonstrated by the fact that Shanawdithit, the last known Beothuk, died of what was believed to be tuberculosis in 1829. In 1878 Dr. James Alexander, who spent five years in the mining town of Tilt Cove on the Baie Verte peninsula, wrote about medical and working conditions in Newfoundland in the Dublin Journal of Medical Science. He found that consumption was “not infrequently met with” and that scrofula was a frequent cause of death among young children. In 1899 the disease killed 655 people in Newfoundland and Labrador, a number which would increase to (and fortunately peak at) 993 recorded deaths in 1906, leading to an average pulmonary TB death rate of 348 per 100,000 people from 1905-1909. Compared to the 1909 death rate of 152 per 100,000 people from all forms of TB in Britain in 1909, this is quite high. In Newfoundland TB continued to be a leading cause of death well into the 20th century, only being overtaken by heart disease and cancer in the 1950s. From 1901-1975, just under 32,000 people died of TB in Newfoundland. Often the victims were males aged 15 to 45. These men were the breadwinners of their families, and the social and economic costs of TB were great. The death rate from TB in Britain declined by approximately 35 - 45 percent (depending on age group and gender) from 1901-1929, although mortality from the disease increased in Europe in the years after World War I. Similarly, mortality was declining in the United States by the 1930s (although not among the black population). Yet the disease remained rampant in Newfoundland and in Labrador. There is no single reason why this was so, but several factors contributed to the spread of the “white plague.” One was the custom of families, often consisting of six to ten people or more, spending time in the confines of the family kitchen, especially in winter when long, cold evenings forced people to gather in the one heated room in the house. A person with active TB would therefore expose their family and visitors to the disease. This situation was made worse by the common habit of chewing tobacco and spitting the juice into a cuspidor or spittoon, as spit and sputum could spread TB. An unvaried diet that often lacked fresh food and certain nutrients (see Malnutrition) weakened peoples' immune systems and left them vulnerable to infections. Once a person was infected, the disease was hard to detect until it became active, when it was much more difficult to treat. Severe isolation meant there was little or no access to medical services, and there was little understanding of the causes and prevention of TB. All of these factors contributed to the high rates of TB infection and death in Newfoundland and Labrador. Despite the efforts of government and anti-TB groups, tuberculosis continued to be a major cause of illness and death for the people of Newfoundland and Labrador until well after Confederation. It was not until the 1970s, after the triumph of pharmaceutical treatments and prevention techniques, that TB was beaten in Newfoundland and Labrador. For more information about the history, pathology, and treatment of tuberculosis, see The Cambridge World History of Human Disease, Kenneth F. Kiple, editor. Or, contact the Canadian Lung Association or World Health Organization.